Seldom seen together or in person the chiefs of Black Widow (also known as Dima Halam Daogah (Jewel) or DHD(J) boarded a Thai Airways Kathmandu–Bangkok flight on Christmas day 2007. Jewel Garlosa, chairman, and Niranjan Hojai, commander-in-chief of the terror group from south Assam, had their fake passports stamped swiftly. Waiting outside Bangkok’s Suvarnabhumi International Airport was a chauffeur who drove them to Nana Tai Mansion on the busy Sukhumvit Road. Soon John Mezo, a Myanmarese arms smuggler who lived in Shillong, arrived. Years of acquaintance—almost 20 deals, more than 100 guns and a few rocket launchers—had yielded results. “You’ve won our trust,” John Mezo said. With these words he set in motion a chain of events that would ripple across India, Thailand, Singapore, Nepal, Myanmar and South Africa, focused on one goal: to fund and arm one of the many uprisings in a far-off corner of southern Assam, distant from mainland Indian imagination. It would land the National Investigation Agency (NIA) its first case, revealing in startling detail the blurred lines connecting politics and militancy in the Northeast, the uneasy compact between government and terrorist—how each feeds off and sustains the other. ssam, which till 1963 comprised the whole of the Northeast save Tripura and Manipur, is a place through which India’s many social, political and ethnic fault lines run. Home to multiple ethnic groups and tribes, all separate nations to their people—and therefore worth a war—the state also harbours 50 lakh illegal Bangladeshi immigrants, according to a 2004 analysis by the union home ministry. The story of DHD (J) and the rise and fall of the multinational operation of gunrunning, extortion of government funds paints a graphic picture of the way insurgencies are born and grow in the Northeast. Its roots lie in money, it operates like a business, and guns are the insurance. Politics in Assam has long been a deadly cocktail of sub-nationalisms and xenophobia; a genuine cry for homelands stirred with dubious realpolitik deals served up as insurgency. Its most cogent expression was the Assam agitation (1979-85), a student movement against illegal immigrants that stormed to power in the 1985 elections under the Assam Gana Parishad banner. Today the leadership, seasoned players in a game of musical chairs called opportunism, is scattered across political parties. BJP is the most recent of its pipers, drawing in Sarbananda Sonwal from the AGP. In 2016, he helped the BJP to power in Assam and became chief minister. Assam was divided into smaller states in stages, often by political accord with militant groups. Nagaland was born in 1963, Meghalaya 1972, and Mizoram in 1987. The militant groups that failed to form their own state have settled for autonomous region status, a political device inserted into the Sixth Schedule of the Constitution to defer thorny questions of identity and self-determination of tribals. It allows for a more involved, elected local government whose writ runs across administrative, financial and legislative spheres. The North Cachar Hills Autonomous Council (NCHAC) which runs Dima Hasao district is one such body formed in 1951. Decades later DHD(J) made the most of it. NCHAC was infiltrated by its ranks, allowing unprecedented access to government funds and untrammelled extortion rights over civil contractors in the district. The group used the money buy AK-47s and rocket launchers, recruit and train men, and control the political outcomes of the region. Between 2006 and 2009, DHD(J) allegedly siphoned off tens of crores and killed hundreds. Fountain Ink reviewed hundreds of pages of case documents, including interrogation reports and wiretap transcripts, spoke to serving and retired officials of state and central intelligence agencies, senior army and police officers, Dimasa activists and Jewel Garlosa, jailed chairman of DHD(J) to examine the Dimasa insurgency. For almost one bloody decade, Jewel Garlosa and Niranjan Hojai made gunfire from the North Cachar Hills reverberate through Dispur to Delhi. Deals were cut in the back of cars with gunrunners of small means and funny names but smuggling folklore centred on the bazaar in Myanmar. The story of DHD (J) and its leaders, the rise and fall of their multinational operation of gunrunning, extortion and embezzlement of government funds paints a graphic picture of the way insurgencies are born and grow in the Northeast. Its roots lie in money, it operates like a business, and guns are the insurance. At least one senior politician, part of the present state government, was involved in the NCHAC scam, multiple sources in the government and DHD(J) told Fountain Ink. In Dima Hasao district, one of the country’s most backward, a young man of enterprise had only two options: a petty job, or the uncertain life of a militant which promised riches and power. Jewel Garlosa had no doubts about his choice. “There was nothing there, nobody paid attention to us. There was neglect, anger and frustration,” he told Fountain Ink at Guwahati Central Jail. And that is the truth of Assam. For almost one bloody decade, Jewel Garlosa, 49 and Niranjan Hojai, 43 made gunfire from the North Cachar Hills reverberate through Dispur to Delhi. Deals were cut in the back of cars with gunrunners of small means and funny names—like Bolero Maalik, Indica Driver or Uncle—but smuggling folklore centred on the bazaar in Myanmar. Joseph Mezo—John Mezo’s conduit—was the gate pass to that market. A Burmese rebel on the run who set up shop in Aizawl, Mizoram, he had a stockpile of AK47s, bolt-action rifles, carbines, pistols and new M16s from the war in Iraq. There was, however, one issue: Myanmarese arms dealers did not meet you, you went to meet them. So, two commanders of the militant outfit played businessmen in Bangkok awaiting Joseph Mezo. Mezo, a devout Christian, was on a “revival crusade” in Thailand in the company of a pastor. During the day he preached, in the night he peddled guns. He told them they would have to journey inside Myanmar’s rebel heartland to place the order. Hojai was excited and shared the news with the top brass in Assam. Daniel Dimasa, deputy commander-in-chief and a rising star, was assured. Something big was about to happen in their corner of India that would “make the state and Centre take notice”. ields of ginger, valleys of oranges, and the primeval forest have witnessed the violence that has gripped the North Cachar Hills. With an area of 4,890 sq. km—6.24 per cent of Assam—and a population of 2,13,529—about 8 per cent of the state—Dima Hasao is Assam’s third largest district, bounded by the hills of Karbi-Anglong and Nagaon to the north and Cachar in the south. The river Kapili separates the North Cachar Hills from Meghalaya, while Nagaland and Manipur lie east. Not too long ago this was all Assam. Six reserve forests and vast stretches of unclassified forest areas make up 95 per cent of the territory. The district—previously called the NC Hills— is run by the NCHAC, an elected local government of 30 members. The political party with the majority forms the ruling class and presides over all departments save general administration, police, treasury, election and judiciary. Groups like the DHD(J) want a Dimasa homeland that would comprise the areas of the ancient Dimasa Kachari Kingdom and neighbouring areas with a large Dimasa population. The capital of the erstwhile kingdom is Dimapur in Nagaland. As an autonomous region, NCHAC gets funds directly from state and Centre. In the mid-2000s when DHD(J) was making its mark, the money was a godsend. Over the years Hojai and his gang treated the council as their treasury as corrupt or intimidated officials kept generating fake bills for large sums that financed DHD(J)’s reign of terror. week had lapsed since their arrival in Bangkok. Hojai and Garlosa were drinking on the rooftop of the Radisson hotel. In walked Joseph Mezo with a woman, a journalist. Hojai told Mezo about their increased needs, say NIA investigators. Traditional sources of supply like NSCN(IM) and clandestine stores in Dimapur weren’t enough. The Isak and Muivah led faction of National Socialist Council of Nagaland’s objective is to establish Greater Nagaland consisting of all Naga inhabited areas including parts of Dimasa territory. A few days later, when they met Mezo again at the Cabbage Hotel in Phuket Hojai asked about the Myanmar arms bazaar. A source in the NIA told Fountain Ink that Hojai knew NSCN(IM) got weapons from Myanmar. As they journeyed to the border, Mezo spoke about Obed, a smuggler with a network in Myanmar’s ungoverned territories. At breakfast the next morning, Hojai met Obed and discussed DHD(J)’s needs. Thailand was just a meeting point. To place an order, Mezo would enter Myanmar on his Indian passport. Hojai, travelling on a Nepali passport that would expire soon, waited in a hotel. When Mezo returned late at night they had a celebratory drink. Reports from Thailand, Cambodia and Hong Kong chronicle Wa arms trafficking. It sells to non-state actors and its primary international clients are Naga insurgents as well as Maoist rebels in Nepal. An order had been placed for 100 AK47s, 300 magazines, 150,000 rounds of ammunition and 100 hand grenades. An AK went for ₹2.5 lakh, M-16 for ₹1.6 lakh. Pistols made in Italy and Hungary cost about ₹1.5 lakh and rocket launchers cost ₹8-12 lakh a piece. The deal was worth ₹2.5 crore. Hojai instructed Daniel Dimasa, deputy commander-in-chief of DHD(J)to give Mezo’s men in India ₹1crore. The money had been converted into dollars by hawala operators in Kolkata. The balance would be paid after delivery. “It will take time but it will happen,” Mezo assured Hojai. n 2007 and 2008 the demand for AK47s was so high that militants on the Thai-Myanmar border faced an ammunition shortage. Bullets sold at inflated prices. In those days of scarcity one group came to prominence. China’s role in weapons supply is well established but by the end of the 1990s, it took a backseat, channelling its trade through proxies, none more faithful than United Wa State Army (UWSA). The UWSA boasts of at least 30,000 soliders. The hilly remote state across the border from Yunnan province is propped up by a drugs and arms economy, and is modelled on China. It owes allegiance not to Myanmar’s Tatmadaw but to China’s People’s Liberation Army. The Wa rebel government conducts its activities in Mandarin and the preferred currency is Renminbi. Sources in the Karen and Kachin fronts say UWSA has been manufacturing AK-47s similar to those made in China at a factory in Kunma in the Wa Hills in northeast Mynamar close to the Chinese border. It is believed the factory works under the patronage of Yunnan-based mafia organisations propped up by ex-PLA generals. aniel Dimasa had received a tip-off. A special patrol train would cross Mupa police station soon after 6:30 am on the Migrandisa-Haflong route on May 15, 2008. It was carrying 22 railway engineering staff and 10 Railway Protection Special Force (RPSF) personnel. As the train passed Mupa, DHD(J) militants on hillocks around a tunnel opening started firing. Loco pilot N. N. Bora reversed the train into the tunnel as the bullets flew. Bora died on the spot. Soon after, DHD(J) fighters retreated into the jungles in the Maibang sub-division. In response, the Northeast Frontier Railways suspended operations between Silchar and Lumding. They evacuated project staff, impacting not just NC Hills but also Manipur and Mizoram who depended on the single rail track for basic goods. This was the ultimate show of power: DHD(J) could stop traffic in the hills of Assam. A key DHD(J) tactic was to obstruct the construction of the broad gauge line. Attacks on the Lumding-Silchar-Jiribam gauge conversion project were commonplace. 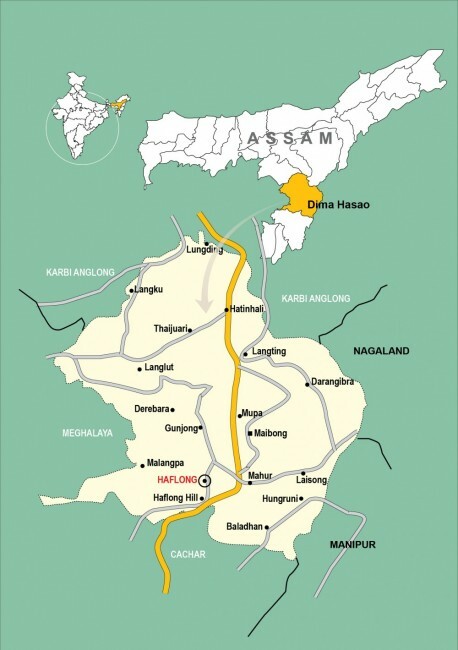 Portions of the 214-km Lumding-Silchar line meander through the Dimasa heartland. The other major project, the national highway under the East-West corridor, also saw similar disruptions. By mid 2008, 16 railway contractors in the North Cachar Hills decided to halt operations after a string of strikes. The state tried to respond: Four companies of the Central Reserve Police Force (CRPF) were deployed but proved ineffective. DHD(J) had home-turf advantage. With superior knowledge of terrain and guerrilla training from NSCN(IM)—the Naga insurgent group—they unleashed a fight the state had not anticipated. Their meteoric rise in the hill district attracted the attention of more established militants. NSCN (IM) trained DHD cadres—before Jewel Garlosa split in 2004—in Bangladesh in 1996, and there was close cooperation amongst the militant groups, claims a NIA source. “They were after anyone, everyone,” recalls a senior police officer who was stationed there. DHD(J) militants killed unidentified saw mill workers. They targeted labourers. They killed a school teacher. They killed policemen. They went after politicians from the Autonomous State Demand Committee (ASDC), a regional party. “There was just bloodshed and fear,” recalls Kailem Daolagupi, president of the Jadikhe Naisho Hoshom, a Dimasa organisation. “They soon challenged the government in the hill areas,” says a minister in Dispur. n February 2009, one year and one month after the deal in Myanmar, Joseph Mezo got a call from the Myanmar smugglers. A consignment of 66 guns had entered from Tahan in Myanmar’s Sagaing district to Champhai in Mizoram and was in Aizawl. It was time for DHD(J) to take delivery and pay up. Mezo called Hojai, who was holidaying in South Africa. Hojai had it figured: Mezo would deliver the weapons at Silchar from where DHD(J) would take charge. On the night of March 22, Mezo told his men to move the guns to Silchar. They checked into Hotel Comfort on the Aizwal-Silchar road where they awaited a DHD(J) man.But their contact was arrested before the meeting could take place. Mezo’s men returned to Shillong where they hid the weapons in a ginger field. On March 25, Mezo took control of the operation. The weapons were put ginger sacks and loaded on a truck. Mezo followed in a Sumo. They reached Ladrymbai in the Jaintia Hills, on the Assam-Meghalaya border. The insurgency won’t go away until the problems that created it disappear,” says a senior army officer. “DHD(J) is gone but there are splinter groups started by Action Dimasa and James Dimasa. From the other side, a Scorpio with a red beacon pulled up. It belonged to a member of the NCHAC. Seated inside were two DHD(J) cadres. The weapons, handed over, were taken from Meghalaya into the jungles of Assam. More often than not, weapons in the Northeast originate from a factory in Ruili in Yunnan province on China-Myanmar border travelling to Tahan on the Myanmar-India border. The Wa rebels facilitate this. Once the weapons reach India, Mizoram is the preferred route for smugglers. Small border villages such as Bairingti with limited patrolling and a few corrupt BSF personnel allow the contraband through. According to NIA, Mezo has on several occasions crossed into Myanmar to pick up weapons. On one occasion he was accompanied by two policemen who demanded a hefty cut. Hojai told NIA that at Bairingti border post there are no scanners so DHD(J) and other militant groups would often collect weapons from this point. But the insurgents have been seriously weakened. Demonetisation has rendered useless the money that was stashed away. They know that they can only be powerful together and the response is a Coordination Committee (CorCom). China played a big role, pulling together divergent rebel outfits into the United Liberation Front of Western South East Asia (UNLFW), a four-part coalition of the United Liberation Front of Asom (ULFA), NSCN(K), Kamtapur Liberation Organisation (KLO) and a faction of the National Democratic Front of Bodoland (NDFB). UNLFW is the outcome of a series of meetings at the China-Myanmar border post at Ruili as well as the Sagaing region of Myanmar in 2011. “S. S. Khaplang plays the biggest role in this,” explains the army officer. S S Khaplang, a Burmese national, was the leader of NSCN(K). He died on June 9, 2017, in Myanmar’s Kachin state of age-related ailments. Also united with UNLFW are six Meitei groups from Manipur. Together they are CorCom. Led by NSCN(K), it includes Kangleipak Communist Party (KCP), People’s Revolutionary Party of Kangleipak (PREPAK), Revolutionary People’s Front and United National Liberation Front. These groups have alliances with each and draw insurgents from Dima Hasao and Karbi Anglong. DHD(J) had no trouble raising money. Threat and intimidation ensured that outsiders engaged in farming, labourers and petty shopkeepers paid a ransom thrice a year. The bamboo trade was a major money-spinner. “They work together. The earlier groups that were decimated were small-scale extortionists compared to the new breed of insurgents.We are dealing with a hardened, more criminalised group, CorCom,” says the army officer. “There are active groups with motivated cadres and a plethora of weapons with access to Myanmar’s terror havens.” The camps are neatly organised on the Indo-Myanmarese border.